If Roger Federer is looking for a little confidence pick-me-up early in his comeback, there’s no better place to be than the Gerry Weber Open in Halle. Federer has won this grass-court ATP World Tour 500 tennis tournament eight times, more than any other event. Federer opens against World No. 68 Yen-Hsun Lu, against whom he has a 3-0 ATP Head to Head record, winning all seven sets they have played. Lu has a 28-34 tour-level record on grass and enjoyed his most memorable moment on the surface in 2010, when he stunned Andy Roddick 9-7 in the fifth set in the Wimbledon fourth round. Federer won the tournament five consecutive years between 2003-07 and most recently in 2015. Last year he suffered a surprising semi-final loss to then World No. 38 Alexander Zverev, who one year later finds himself inside the Top 10 of the ATP Rankings. Federer has a potential second-round meeting with Zverev’s older brother, Mischa Zverev, whom he defeated 6-0, 6-0 five years ago in Halle. But Zverev is a far-improved player whose serve-and-volley game is well suited to grass. And the German on Monday will break into the Top 30 of the ATP Rankings for the first time in his career. 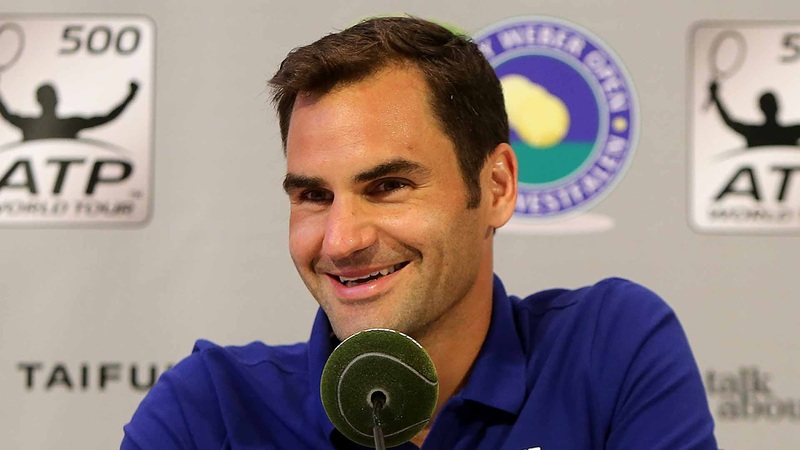 Despite his opening-round defeat to Haas last week in Stuttgart, where Federer returned after a two-month sabbatical, the Swiss said that he had not second-guessed his decision to skip the entire clay swing after beginning the season 19-1, with titles at the Australian Open and the ATP World Tour Masters 1000 level in Indian Wells and Miami. “It could have been better in Stuttgart, but then again I had match point,” Federer said. “It wasn’t like I lost 6-2, 6-2 and everything was terrible. A comeback is never simple, especially on grass where margins are so slim. It’s a serve or a passing shot or a return that determines the outcome of the match. That’s what it ended up being against Tommy, even though I felt I should have found a way home, having been a set and a break up. “Considering how well I felt going into Paris, it was surprisingly easy to take the decision and after making it I never had any regrets watching it or following the results. I never thought ‘If only I was part of the tournament.’ I was looking ahead to the grass season and enjoyed the time with my friends and family at home. “It was a decision that was taken within a couple of days. It wasn’t something I saw myself doing weeks and months ahead of the tournament. For a long time the schedule was to play Paris but all of a sudden I just felt that I wouldn’t be comfortable doing it. I didn’t want to compromise the goal of the grass-court season, Wimbledon, the US Open and beyond. “I felt that the French Open may potentially have a negative effect on what’s to come. It may have been helpful, but I felt there was more risk that it would go the other way. Based on health, that’s why I decided to skip.